A FEW WEEKS ago Frank Haxel helped me find a cheap car. It was a 2000 Pontiac Grand Prix with a gazillion miles on it and a rebuilt engine, but it had been immaculately cared for and was perfect for bombing around town to gigs and doing errands and taking dogs for walks. Cheap, of course, is relative, but for the money it was awesome and fortunately I was able to pay cash. The first thing that happened was that I set off the car alarm (the previous owner had no idea how it worked because HE never set it off), then I had to get a new tire, but it's been running perfectly. I named her Red and I was happy. Buh Bye, Red. I hardly knew yee. Yesterday about 12:45 Red was parked in front of Electric Fountain Brewing and 505 Maine. I had run errands in the morning and parked it there with the intent of moving it, and I was actually thinking about doing just that. I was in the coffee shop talking to somebody when I looked out the window, heard a tire screech, and much to my horror saw an SUV smash head-first into my parked car. I couldn't believe it. I think I jumped up and down and cussed, somehow I ended up outside and when I saw the crumpled left front side I fell to the ground. The driver of the SUV was actually coming from the west. He crossed over the center line before crashing into my car. He was out of the vehicle and appeared shaky but OK. Apparently he may have "dozed off" before the crash. Later on I realized who he was and he's a really good guy, and there's no way he did something like this on purpose. I do remember walking away after Sheryl came out (with a guitar in her hand she was working on) and started talking to the driver. "You are really tall and that makes you look overly dramatic" she said. Right. All I know is that I finally found a decent car and in an instant it all changed. So I walked away, composed myself in the back room, apologized to the people in the coffee shop for my language, and talked to the Quincy Police officer who was doing the paperwork. The car was hit so hard that it smacked into the car behind it, which had major damage to the hood and a scratched bumper. That guy wasn't acting like a doofus and losing his mind like me, but he wasn't happy, either. The SUV driver apologized profusely. I told him I was upset because I just got the car, but I wasn't mad at him. It happens. You deal with it. Now it's sitting at a local body shop. I am waiting for the estimate, but I'm sure it's totaled. "Well, it's not looking good," was all the body shop guy could tell me yesterday. 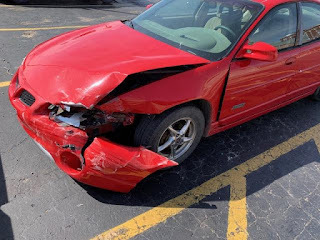 In addition to all the body damage it was leaking something and the wheel would barely turn, and the front passenger door almost didn't open. We will see. If it is, then I have to deal with insurance companies and pray I get what I paid for it. All I know is that there's no way I'm finding such a great car for the price, but we'll worry about that later. Aspen in the coffee shop made me a coffee with a little CBD oil in it and Sheryl gave me a 1/4 pill of some kind, so I got through the rest of the afternoon's lessons. Actually, guitar lessons helped. Therapy, baby. Could have been worse. I could have been in it. And you never know... maybe I'll find something just as good or better to bomb around town in. But I won't be parking it in front of 505 Maine.